Living on the water is often an existence at the margins of society. 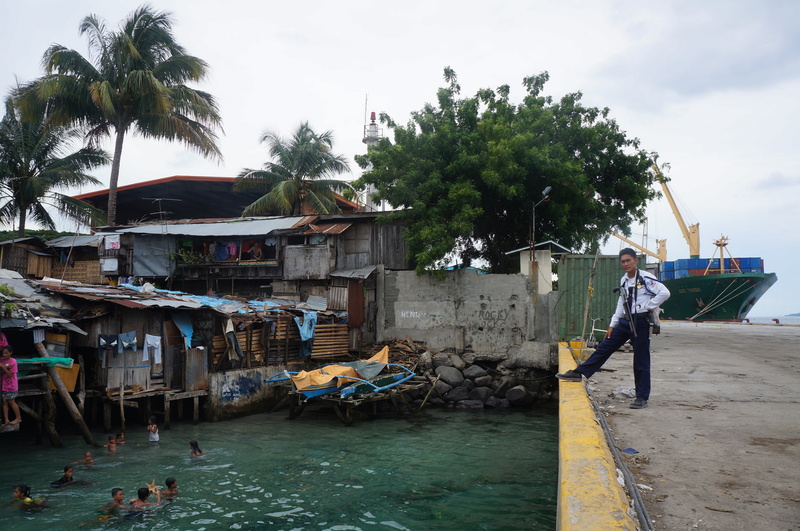 The children living in stilt houses in this port in southern Mindanao, Philippines, are young members of a squatter settlement that is exposed to storm surges and flooding. A powerful typhoon struck the area the year before this photo was taken and washed away thousands of such homes, killing over a thousand persons across the island. Yet, on calm days like this one, the water is the children’s playground and they are spending their days frolicking in it, making somersaults from the "bangka", the small wooden boat laid up on the platform in the center of the photo, and diving for treasures on the sandy bottom, such as the starfish in the picture, or the various plastic items that accumulate there. Sometimes they play by the large passenger "bangkas" at a nearby pier, urging travelers to throw coins in the water for the children to dive for. Another community living a marginalized existence on the water is the crew working on board the container ship to the right in the photo. While the work of seafarers is central to the world economy with over ninety percent of the world’s traded goods being transported by sea, for many of those who work and live on board, the sea is less a space of connection than it is a giant moat separating them from society ashore. Many sailors go to sea with dreams of freedom and of “seeing the world for free”, but the reality is different. Filipino sailors, who make up around one third of the world’s seafarers, typically have contracts of six to nine months, and during those months they rarely get the chance to step a foot ashore. Ships may be moving links in a global system of mobility, but the faster the goods and the ships move, the more confined the people on board the ships become, and many seafarers speak of their ships as prisons. In today’s containerized shipping industry, ships spend only a few hours in port, leaving almost no time for crewmembers to go ashore. And while historically ports were often the very heart of cities in shipping circuits, with port areas bustling with life, today container terminals are usually located at the outskirts of cities. Looking out from a ship at berth today, one sees not a bustle of bars and brothels, but a container terminal where the only colorful elements are the rows and stacks of shipping containers. The port itself has become a kind of “non-place”, an intermediary zone, often highly securitized, between ships and shore. Neither the ship’s crew nor the local communities living nearby actually venture into this space, each staying on their respective side of this concrete border landscape. The armed security guard standing on the quay that separates the two worlds illustrates this distance. Having done research both in coastal settlements and ports in the Philippines, and on board internationally sailing cargo-ships with Filipino seafarers, I know that the step from being a child from a squatter area to becoming a dollar-earning seaman on an international vessel is a big one. But it is possible. Seafarers move worlds in more than one sense. They move the goods of the world. They regularly move between the world of the ship and the world back home. They live on board ships that are themselves moving worlds, entire multicultural communities in perpetual movement across the ocean. Finally, some have moved social worlds from a poor coastal community existence to a high-paying job on an international ship that allows them to send their own children to private school and to provide their families with a home that is safe from storm surges. This photograph of the sea, the ship, and the two sea dwelling communities is an image of the global and the local. It also illustrates the sea’s ability to both connect and separate, and shows how the sea is a space of recreation and play, as well as of work. Finally, it represents the interplay of mobility and immobility, physical as well as social. 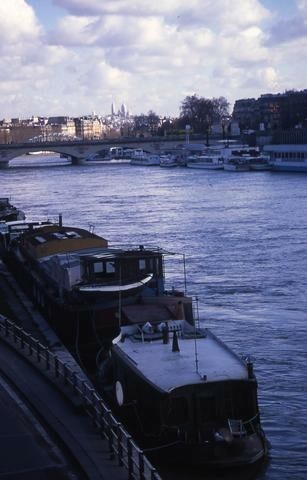 Rachel Tanur’s photograph of houseboats on a river in France is a beautiful image of people living on the water. The quay in the photo, along which the boats are moored, forms a line of demarcation through which life afloat is separated from life on dry land: even when lived inside the cities that are the very centers of the global economy. The people I have met who live aboard houseboats or sailboats on the waterways of cities such as Paris, San Francisco, London and New York often choose this as an alternative lifestyle that allows them to detach themselves (quite literally) from landed society and its demands. Many work in start-ups or in the creative professions, and are attracted by the independence of life afloat combined with affordable central living. This autonomous lifestyle, however, also means lack of access to services often taken for granted ashore, such as garbage and sewage disposal, as well as fresh water supply. The combination of autonomy and freedom on the one hand, and the marginalization and exclusion on the other hand, is characteristic for many communities who live afloat. For example, the Sama Dilaut, or “sea nomads”, have traditionally lived on houseboats along the shores of Mindanao in southern Philippines, though today many live in stilt houses instead. They are the poorest and most marginalized of the region’s ethnic groups (Jumala 2011), and often lack access to the benefits of landed society. However, in the conflict ridden region of Mindanao, their boat dwelling lifestyle has also allowed them to leave from areas in times of conflict among landed groups, to move to more peaceful locations (Jumala 2011). The sea and ships have offered a space of freedom and autonomy for other marginalized groups too. Rediker’s (2004) account of pirate crews in the early 18th century showed how these crews absorbed society’s outcasts and deviants, such as criminals, cross-dressing women and runaway slaves, offering alternative and more democratic communities in which crewmembers were able to transcend the restrictive bounds that society imposed on them based on their race, class, gender or personal history. This has been true for merchant crews as well, many of which consisted of people who went to sea to escape obligations or punishments ashore. However, if ships have been spaces of freedom and escape from the bounds of society, they have also been spaces of coercion and imprisonment. Galley slaves, the transatlantic slave-trade, indentured labor, impressment and shanghaiing are examples of forced labor practices in maritime history that continue into modern times as seafarers may often be coerced to work without pay, or tricked into debt-servitude. Historically, ships have also been used as floating prisons to rid society of its undesired persons. According to Foucault, “ships of fools” roamed Europe’s rivers in medieval times, allowing cities to dispose of their “madmen”. He writes, “Locked in the ship from which he could not escape, the madman was handed over to the thousand-armed river, to the sea where all paths cross […] A prisoner in the midst of the ultimate freedom, on the most open road of all, chained solidly to the infinite crossroads. He is the Passenger par excellence, the prisoner of the passage” (2006:11). This dynamic contrast between the ideal of freedom, mobility, and desire to “see the world for free” on the one hand, and ships as prisons and marginalised spaces on the other hand, is constantly present also in the narratives of the seafarers with whom I do my dissertation research. And it is, I believe, at the very foundation of life lived on the water. Foucault, Michel. 2006. History of Madness. London: Routledge. Jumala, Francis, 2011. “From Moorage to Village: A Glimpse of the Changing Lives of the Sama Dilaut”, Philippine Quarterly of Culture and Society, 39(2): 87-131. Rediker, Marcus, 2004 Villains of All Nations: Atlantic Pirates in the Golden Age. Boston: Beacon Press. Rachel Tanur’s photograph of houseboats on a river in France is a beautiful image of people living on the water. The quay in the photo, along which the boats are moored, forms a line of demarcation through which life afloat is separated from life on dry land: even when lived inside the cities that are the very centers of the global economy. The people I have met who live aboard houseboats or sailboats on the waterways of cities such as Paris, San Francisco, London and New York often choose this as an alternative lifestyle that allows them to detach themselves (quite literally) from landed society and its demands. Many work in start-ups or in the creative professions, and are attracted by the independence of life afloat combined with affordable central living. This autonomous lifestyle, however, also means lack of access to services often taken for granted ashore, such as garbage and sewage disposal, as well as fresh water supply. The combination of autonomy and freedom on the one hand, and the marginalization and exclusion on the other hand, is characteristic for many communities who live afloat. For example, the Sama Dilaut, or “sea nomads”, have traditionally lived on houseboats along the shores of Mindanao in southern Philippines, though today many live in stilt houses instead. They are the poorest and most marginalized of the region’s ethnic groups (Jumala 2011), and often lack access to the benefits of landed society. However, in the conflict ridden region of Mindanao, their boat dwelling lifestyle has also allowed them to leave from areas in times of conflict among landed groups, to move to more peaceful locations (Jumala 2011). The sea and ships have offered a space of freedom and autonomy for other marginalized groups too. Rediker’s (2004) account of pirate crews in the early 18th century showed how these crews absorbed society’s outcasts and deviants, such as criminals, cross-dressing women and runaway slaves, offering alternative and more democratic communities in which crewmembers were able to transcend the restrictive bounds that society imposed on them based on their race, class, gender or personal history. This has been true for merchant crews as well, many of which consisted of people who went to sea to escape obligations or punishments ashore. However, if ships have been spaces of freedom and escape from the bounds of society, they have also been spaces of coercion and imprisonment. Galley slaves, the transatlantic slave-trade, indentured labor, impressment and shanghaiing are examples of forced labor practices in maritime history that continue into modern times as seafarers may often be coerced to work without pay, or tricked into debt-servitude. Historically, ships have also been used as floating prisons to rid society of its undesired persons. According to Foucault, “ships of fools” roamed Europe’s rivers in medieval times, allowing cities to dispose of their “madmen”. He writes, “Locked in the ship from which he could not escape, the madman was handed over to the thousand-armed river, to the sea where all paths cross […] A prisoner in the midst of the ultimate freedom, on the most open road of all, chained solidly to the infinite crossroads. He is the Passenger par excellence, the prisoner of the passage” (2006:11). This dynamic contrast between the ideal of freedom, mobility, and desire to “see the world for free” on the one hand, and ships as prisons and marginalised spaces on the other hand, is constantly present also in the narratives of the seafarers with whom I do my dissertation research. And it is, I believe, at the very foundation of life lived on the water. References Foucault, Michel. 2006. History of Madness. London: Routledge. Jumala, Francis, 2011. “From Moorage to Village: A Glimpse of the Changing Lives of the Sama Dilaut”, Philippine Quarterly of Culture and Society, 39(2): 87-131. Rediker, Marcus, 2004 Villains of All Nations: Atlantic Pirates in the Golden Age. Boston: Beacon Press.